This group is responsible for the weekly house-keeping of the altar linen. Volunteers, for occasional duty, are always very welcome. A few adults serve at week-day Masses and the younger members, both boys and girls, serve at Sunday Masses (every second week) and on special occasions. New members, adults and young, are always needed. Applicants for altar servers should have celebrated their First Holy Communion. The team hosts a baptism preparation meeting to which parents are invited and where the baptism ceremony is explained through symbols. The team also assists the priest and parents at the baptism ceremony. Baptisms are on the second Sunday of the month at 11.00 am and on the third Saturday of the month at 12 noon. The baptism preparation meeting is on the Wednesday before the second Sunday at 8.00 pm in the parish centre. Three weeks notice is required for booking baptisms. This group provides confidential support to people following their bereavement. They are trained to listen sensitively and in a non-judgemental manner. They are available to meet with the bereaved on the third Saturday after the 10.00 am Mass in the parish centre. Members of the group aim to visit each bereaved family at least once. They also help to organise the annual November memorial Mass for those who have died in the parish in the previous twelve months. A parishioner works to beautify the sanctuary area with arrangements of flowers. The floral displays bring fresh colour to our church and enhance our worship space. A team of volunteers takes up the collection at all four of the Sunday Masses. Two collections are taken up at each Mass. The first collection is to support the priests of the parish, retired priests and priests working in the poor parishes of the diocese. The second collection is for Share and goes to the diocesan office for the development of new parishes and also for the reconstruction of old churches. Lay Ministers of the Eucharist help to distribute communion under both species (bread and wine) at all the Masses celebrated in our parish church. They also bring the Eucharist to house-bound parishioners, and some assist with bringing communion to the Clontarf Hospital in the parish. People who wish to participate without receiving the Eucharist, or young children who have not yet received their First Communion, can approach any priest or minister with arms crossed over their breast to receive a blessing. The Eucharistic ministers come together three times a year to reflect on their ministry and to address practical issues. 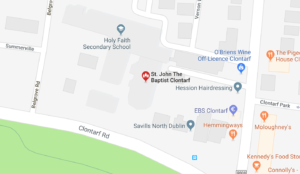 Every Tuesday evening from 8.00 to 9.00 pm a group of parishioners come together in the basement of 183 Clontarf Road, a house of the Holy Faith sisters, to prayerfully reflect on the readings for the following Sunday. The hour is primarily a time of silent reflection with opportunities for some sharing based on the readings. Library Group A small group manage the lending library in the parish centre on one afternoon a week, lending out books and receiving back books that have been loaned. This group meets to meditate quietly every Monday at 8.00 pm in the St John’s Presbytery, 187 Clontarf Road. A team of readers proclaims the word of God at the weekday and Sunday readings. They come together three times a year to reflect on their ministry and to address practical issues. The work of the Sacristan is very varied. Duties include opening and closing the church, preparing the altar for Masses, Baptisms, Weddings and Funerals, stocking the shrines with candles, removing the shrine money daily and counting the Sunday collections. A small team of people cover the duties of the Sacristan on a regular basis at weekends.